My card today was created for FatCatsCardCorner, and I made it by first tearing a page from an old book, cutting to size and then inking the edges with Tumbled Glass Distress ink, I curled one corner the back of which which was also inked with the Tumbled Glass Distress ink. The flower was created with three different sized EK Success Retro Flower punches. The lace strips are a Paper self adhesive lace borders from FatCats and I have coloured them with a copic marker to match, and stuck on some flat backed little pearls. Oh and the little embossed corner is a small Cuttlebug embossing folder. My stitched hedgehogs are from Stitching Cards and I have stitched them onto a large Nestability circle, then after stitching, put them back into the die to sponge some Memento Angel Pink around the little critters. Behind the circles I have put one of the Spellbinders Fancy Tags 2, from FatCatsCardCorner which fitted perfectly behind the circle without having to cut them. cut out with Spellbinders classic rectangles small and then embossed. 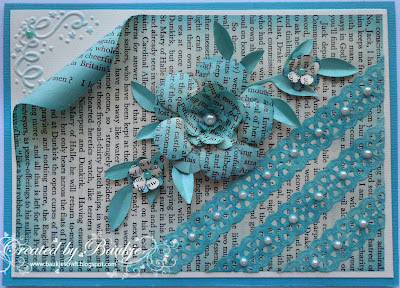 Border is the Martha Stewart punch around the page Double Loops, and the roses were made by me. 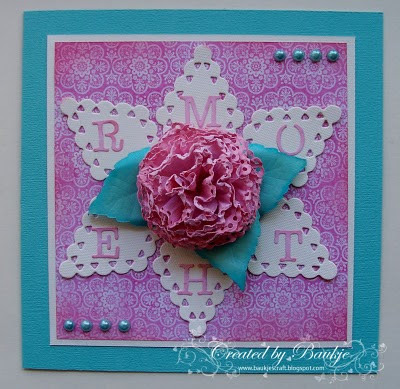 For this card I have made the flower with the Nellie Snellen multi frame die, Doily. I have made it with the method that there are hundreds of videos for using a scallop punch. The star shape behind the flower is 6 of the Diamond die cuts, the leaves are a cuttlebug die. The letters were also a cuttlebug alphabet die set called typewriter, I'm not really happy with the way I have placed them, but there's not really enough room to have them any other way. they are again the sweetheart flower named for her mother. The lattice I have woven the Creatables leaves through is from Dies Direct called Lattice 2 and I bought both of them from FatCatsCardCorner. The hanging sentiments sign is made from the cut outs from the die, and the whole thing is layered onto the Sizzix bricked embossing folder. I have another Sweet Dreams Marci card to share today. You can get Marci here. E00,E11,R20, Y21,E35,YR23,V17,V09,V06, BV00, C1,C5 and C7 after stamping her onto X-Press It Blending card. 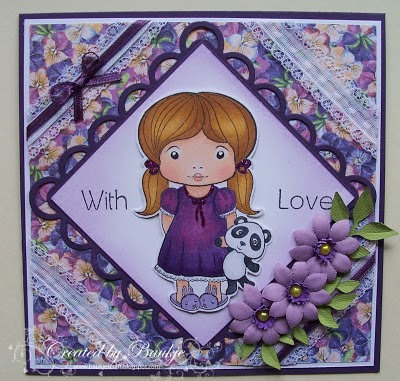 Marci was cut out and placed on a piece of white card which I inked around the edges using .Memento Lulu Lavender ink, this was then layered onto Spellbinders Lacy squares, (the largest one) which I purchased here. 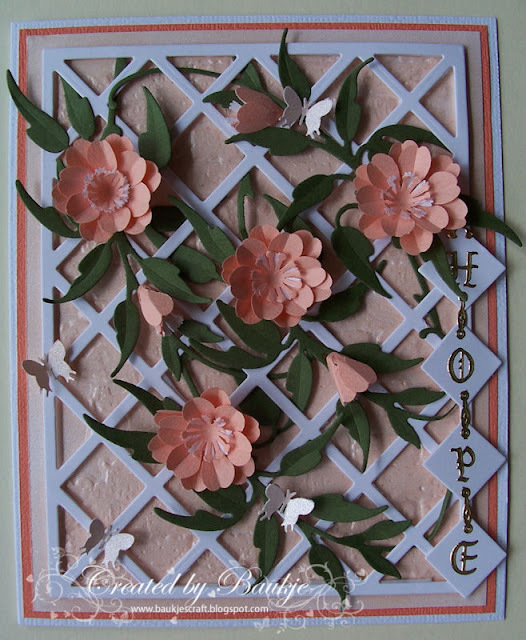 Added some lace and ribbon, hand made flowers and the leaves which were cut with a Sizzlits Die which you can get here.